The current racetrack is 2.238 miles in length with a 180 feet elevation change. It has eleven turns, including the famous “Corkscrew” at Turns 8 and 8A. A variety of racing, exhibition and entertainment events are held at the raceway. 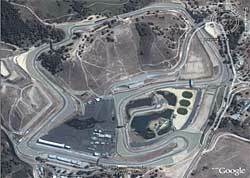 The name Laguna Seca is Spanish for “dry lake” – the area where the track now lies was originally a lake, and the course was built around the dry lake bed. After the course was reconfigured, two artificial ponds were added.